Reading the verses preceding Romans 8:24 you’ll discover the hope Paul is referring to is life beyond this life, so I hope he don’t mind if my foresight doesn’t go as far as his because even though I hope for Life/Living after life/living I continue to hope for tomorrow, the next day, the next day, the next day, the next day, and you get the idea. It would be great if everyone of us had our own crystal ball that opened up the future for us, but we don’t. because of the technology the weather tomorrow can be predicted with a great deal of accuracy, the financial future can be predicted with a fair amount of accuracy, but who among us can predict whether or not we’ll be in a car accident or our house will catch fire? One of the primary things we need to remember is to measure our successful navigation of bad things at God’s standard of success not our own measure of success. Success as we measure it can only be temporary at best life/living today is to fluid to maintain a high degree of success. Unlike human measure of success God’s measure of success has at times turned lives world upside down for example God’s greatest success happened on a wooden cross and ended with an empty tomb, and that success has fallen on you and I. 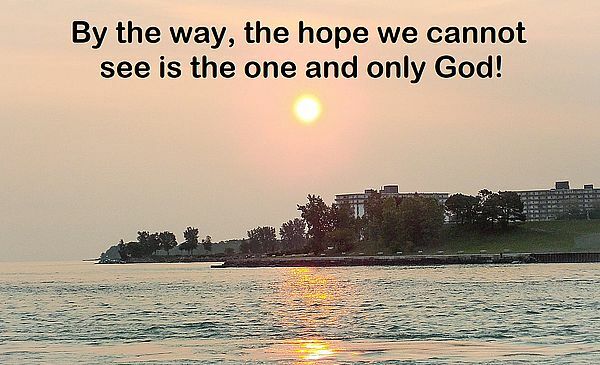 By the way, the hope we cannot see is the one and only God!